To set up a remote device (i.e. one you don’t have directly in front of you to connect to your authorised Xcode) you need its serial number, which can be found by clicking on the info tab in iTunes. 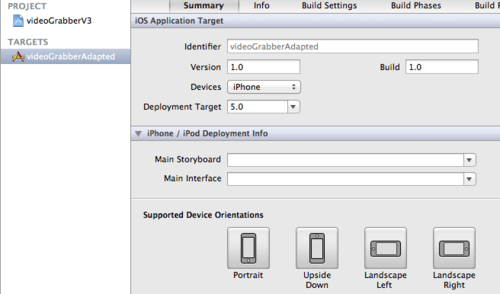 Within each provisioning profile (developer & ad-hoc) you can set-up and assign the devices in the provisioning portal through developer.apple.com. Each remote device needs to have a mobile provisioning file (.mobileprovision) installed before it can accept the test apps. This file is simply dragged and dropped into iTunes with the device connected. Now for creating the test app so email to the testers. We have a template Xcode project for archiving as there seems to be a back end setting that determines the type of archive you create. These are differentiated by the icon of the archive in the organiser. For OpenFrameworks is seems that setting the target build for iPhone is far more stable for both iPhone and iPad than choosing iPad or Universal from the devices menu. Then clean build the folder and select Archive under Products in the menu bar. This icon means that the wrong archive has been done for creating a .ipa app that can be sent to the ad-hoc and distribution devices. This icon is the correct type of archive for distribution. I’m still unsure as to what the difference is or what the setting is that changes it, but I don’t really need to know right now. Select the archive you want to convert into the test app in the Organiser and select Share. Here you can choose which profile it builds for, ad-hoc or Developer and then save as. Job done.